In the past, for example, it was possible to study the mobility of people within the United States by monitoring things such as the movement of banknotes . Today we can use something that is much more global and widely available than US cash. Mobile phones have almost totally infiltrated human society, with the number estimated at more than 7 billion in 2014 . Ownership of mobile phones continues to grow , even in some of the poorest countries. Many of those phones are geolocated, continuously providing the geographic location of the user, so effectively acting as tracking devices for human populations. As biologists, our understanding of animals has been transformed over the past four decades by our ability to track their movements and behaviour. We were interested to see what we can learn from the use of mobile phones tracking, as we show in a study published this month in Trends in Ecology and Evolution . It’s now possible to use the mobile phone data to gain a better insight into human movement under certain conditions. For example, mobile phone data was used to study the movement of people during the 2010 earthquake and subsequent cholera outbreak in Haiti, and Hurricane Sandy in the United States in 2012. It was interesting to note that the human reaction to escape from certain events we found was close to that of some animal groups, such as birds and fish, when fleeing from attack . Such studies can help predict how people will respond in the future to any emergencies, and help to improve the delivery of any aid or disaster relief. The detail, immediacy and sheer volume of data from mobile phones also offers innovative ways to monitor and possibly solve some of the most pressing conservation problems that animal populations now face. For example, geolocated phones are changing the way we tackle the crisis of illegal wildlife trade. Not only is it a major driver of species extinctions, but the human cost is high with more than 1,000 wildlife rangers killed in the line of duty over a ten-year period. In India, rangers on the front line use a smartphone app to monitor movements and record sightings of targeted species, such as tigers, and to report suspicious activity. In Africa, mobile phones help rangers collate social and environmental information about reserves and encounter rates with animals killed by poachers. The data collected by these apps is vital to combating the wildlife trade, improving our understanding of movements of both animal and poachers. Phones confiscated from poachers even provide intelligence on their hunting strategies and trading networks. Illegal fishing and overfishing is an enormous global problem. Yet accurate data on the behaviour of fisherfolk is both difficult and expensive to collect, and notoriously misreported. Mobile phone apps can offer a simple solution to this problem, providing real-time data to estimate fishing pressure and catch statistics. Importantly, they also describe movements among locations, tracking compliance to regulations and the risk of spread of invasive species. At the scale of stocks, data helps minimise bycatch to reduce the environmental impacts of open ocean fleets. 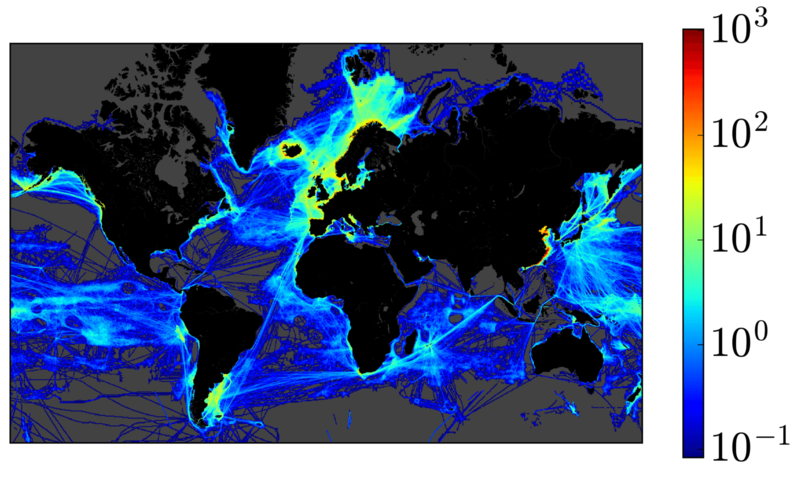 At a global scale, automatic ship identification systems allow observers to track real-time movements of fishing fleets across oceans. Automatic vessel identification systems provide movement of fishing vessels. The scale shows the volume of traffic. Road vehicles and trains kill trillions of insects and millions of other animals every year. Mitigation is difficult because gathering data on roadkill is both time consuming and expensive. Mobile apps provide a solution by enlisting citizen science to provide essential data the location and species type of any roadkill. This information can be used to mitigate impacts through the identification of roadkill hot spots and migration corridors. The data could be programmed into navigation systems for cars to warn drivers where and which animals are most likely to appear on roads. This type of approach is already being adopted to reduce ship-strike. Shipping has grown enormously over the last century and is now responsible for transportation of 90% of global trade . More than 90,000 commercial vessels crowd global shipping routes putting large marine animals such as whales and turtles at risk. Ship-strike is so common in the North Atlantic that right whales are failing to recover from whaling, despite more than a century of protection. As a consequence, authorities have developed a Whale Alert app that uses automatic vessel identification systems to provide real-time information on vessel movements combined with animal tracking data to reduce ship-strike deaths. These are just some examples of the ways that tracking data from mobile phones can be used to help monitor the movement of humans and animals. But the data available is only set to grow as we see the greater use of wearable devices and the linking of digital social networks.